It's not often that a cover will draw me in to the point that I actually purchase the book without doing a bit of homework first. Of course, when you're walking the convention floor, meeting, greeting and networking, there's not a lot of time for homework of any sort. Enter, this book. I walked up to the table with the intent on giving my little sales pitch and instead walked away a bit lighter in the pocket but with a brand new book for the boys and I to check out. Either I need to get stronger or stop taking money with me to these things! Some of those folks are serious salesmen! I do have to say though that if you're passionate about your project, that will draw in a reviewer like me faster than anything. More than once, I've agreed to review a project I wasn't sure about simply because the person behind the table was so passionate about it. This author..well, he was passionate and after reading this book, I can see why. The Crimson Battle Axe, a sword-and-sorcery hero story about justice versus vengeance, love versus apathy, forgiveness versus bitterness, and good versus evil. Throughout the story, tough choices must be made by the main characters - they must choose the right path while constantly challenged by doubts and dark forces working against them. Through fantastic battles and tender moments, with humor and unlikely friendship, five travelers follow their destiny on an amazing quest. The Good : This book is one that you'll pick up and just keep reading. If I'd had the time, I think I would have read it straight through on the first run. The characters are interesting and let me tell you that the one monster that they fight had me going wow, where can I get one of those? I promise to only use it for good, but where can I find one? The Bad : There is a lot of focus on descriptions. While this really does help visualize what is happening in the book, sometimes it was just a little bit too much. I felt as if some of the character descriptions could have been broken up a bit throughout the book and details introduced to readers as they went along. 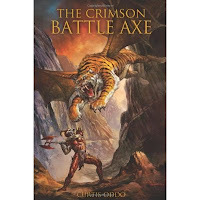 The Summary : This book is one that is not only geared towards action/adventure/fantasy loving kids of around my boys' ages, but one that adults can enjoy as well. It's one that I intend to add to our reading shelf for those hot summer nights when the boys laze around and I read to them. I have a feeling that they're going to love meeting Gnarl, Garon, Hailstriker and the others. If you're interested in adding this book to your collection, it can be found on the author's website as well as on Amazon.